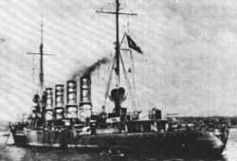 German High Seas fleet in the North Sea. HMS Mauretania sporting razzle-dazzle camouflage. This was meant to hamper u-boat targeting. Profile of HMS Iron Duke. HMS Barham at Scapa Flow. 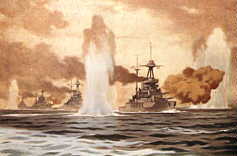 British battleships return fire as the first salvos at the battle of Jutland explode in the water.